My first post is probably something all of us have thought about, or had a go at, and it's something that I was inspired to do again as we are using tea leaves at the moment, and I hate just throwing them away. 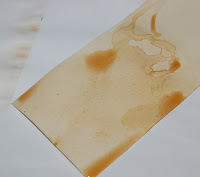 Tea of course has it's distinctive colouring - which is great for dying your papers and cardstock. Take wet tea leaves and leave them on your card to dry. The longer left, or the wetter the leaves, then the darker the shade you can obtain. Alternatively you can pop your left over tea (without the milk), into a spritzer bottle. Mix with some pearlescent powder if you want a shimmer, and spritz. The more layers of tea you spritz, the darker tone can be achieved. The place the tea is forced to dry in will result in a darker result - keep spritzing and drying until you are happy with the result. You can of course "chase the drip", all over your card and you will get veins of colour - looks ace. The samples below show the various depths of colour that can be achieved - just with a good ole cuppa! Love the new blog and the top tips! I would have just rubbed the tea bag over the card so your tip of putting the tea leaves in a mister bottle with some shimmer is fantastic! You have continued to inspire me over the last 2 years since I started blogging for your Friday challenges. I must try this technique - anyone for a cuppa?! I also like how you have listed your C&C dates on the side. I hope they repeat you on a Saturday morning for us girls who can't watch in the week! I'm so excited for you!!! This is a great tip hun thanks :) Some of my buddies use coffee granules as well to colour their card. Fantastic idea for a new blog.... just what we all need in these struggling times.